Matt: Good MORNING Shut Up & Sit Down Shupuppers. That’s my new name for anyone reading the news right now – you can’t do anything about it, I’ve sent the stickers to print. It’s a bright and bracing day in London and I am positively brimming with vigor and vizz – partially because of a chilly morning bike ride, but mostly because of the weekend efforts of everyone involved in Hbomberguy’s charity stream. Raising almost $350,000 for the UK trans support charity Mermaids – in response to other mainstream funding being cancelled after a campaign of organised spite – this colossal achievement had me grinning all weekend at the sheer joy of what now seems possible. A US Congresswoman dropping in on a Donkey Kong 64 stream is exactly the tenor of madness that I get out of bed for – but the whole event has flicked some sort of switch in my head, and I now feel so much better about reality in general. So if you were involved in that in any way – thank you! Matt: How did that go? Quinns: When I tried to cook them they DISSOLVED. My wife said she’d never heard me sound so anguished. Matt: Hahahahaha, I adore that following on from writing that line and seeing me respond with a typed line of laughter, you immediately hopped into Slack to talk seriously about your Falafel disaster. Never change, Mr Smith. Quinns: Our top story this week is the announcement of Days of Wonder’s 2019 game, a classical-era roll’n’write called Corinth (pictured at the top of this page). For those unaware, Days of Wonder are the company behind such colossal hits as Ticket to Ride, Small World and Memoir ‘44. They also maintain the unusual business practice of releasing just one beautiful, well-supported new game each year. Back when I interviewed them 6 years ago and they compared themselves to the Porsche of the board game world, this seemed wise. More recently… let’s just say their curation hasn’t been so hot. By most accounts, The River (2018), Yamatai (2017), Quadropolis (2016) Five Tribes (2014) and Relic Runners (2013) were attractive but disappointing. Even still, this year I’m feeling optimistic about Corinth, their 2018 bite of the apple. Based on a 2006 game called Yspahan, Corinth will see players claiming dice that allow them to manage gold, camels, market stalls or even maneuver an imaginary “steward” around a grid to claim rewards. Mostly though, after having so much fun last year with Welcome To, I’m looking for another chewy, colourful roll’n’write to play in the pub. Quinns: The sequel to romantic relationship simulator Fog of Love has been announced, and it’s even more ambitious. 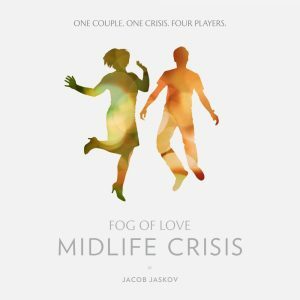 Fog of Love: Midlife Crisis will simulate a couple having (yes!) a midlife crisis. Stranger still, this will be a four player game. Now, designer Jakob Jaskov has told me about this game. If memory serves, two players will each represent one member of a couple, just as if you were playing Fog of Love. However, two additional players will each represent the unexplored aspect of each of these people. In other words, sat opposite you will be two players, one representing your lover, the other representing the part of your lover that might want to buy a sports car, build a greenhouse, quit their job, have a kid, and so on. With four people pulling in different directions, will the relationship survive? Jakob’s also teased that the third game in the series will be about the relationships of people at the very end of their lives. Suffice to say, if you thought Mr. Jaskov would try something a bit simpler for his next game after Fog of Love, you’d be dead wrong. Matt: Finally today I received an email about “conspiracy” that didn’t lead to me wiring a man dollars on PayPal to assist with hunting the alien squad that murdered Princess Diana. Conspiracy: The Solomon Gambit is the next forgotten gem to be brought back to life by Restoration Games. A network of spies shift around the globe, passing a suitcase of secrets to one another. The twist here is that no-one wholly controls these spies, you simply bid for control of them on a turn-by-turn basis. Of all of Restoration’s re-jazzed games to date, I feel like this is the one I’m most personally excited about – a fascinating design from 1973, with rules tweaked to fix some of the issues with the original game. Most importantly to me though – as Shut Up & Sit Down’s resident artyfart – I adore that they’ve embraced the aesthetic of the era. Actual modern spies are more likely to resemble your boring niece, but as someone who grew up falling in love with re-runs of The Man From U.N.C.L.E. there’s an immediate connection to this fabulous fashion. Dossiers, suitcases, jet-flights to Paris. It’s a dark art crafting a thing that looks simultaneously old and modern, and from afar it looks like Restoration might have nailed it. Quinns: Le Scorpion Masque, publishers of the phenomenal Decrypto, have announced their next party game. 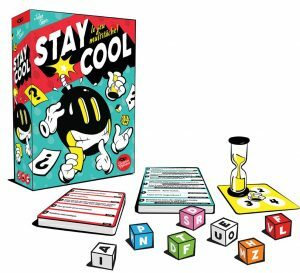 It’s called Stay Cool, it sounds like a panic attack in a box and I can’t wait to try it. 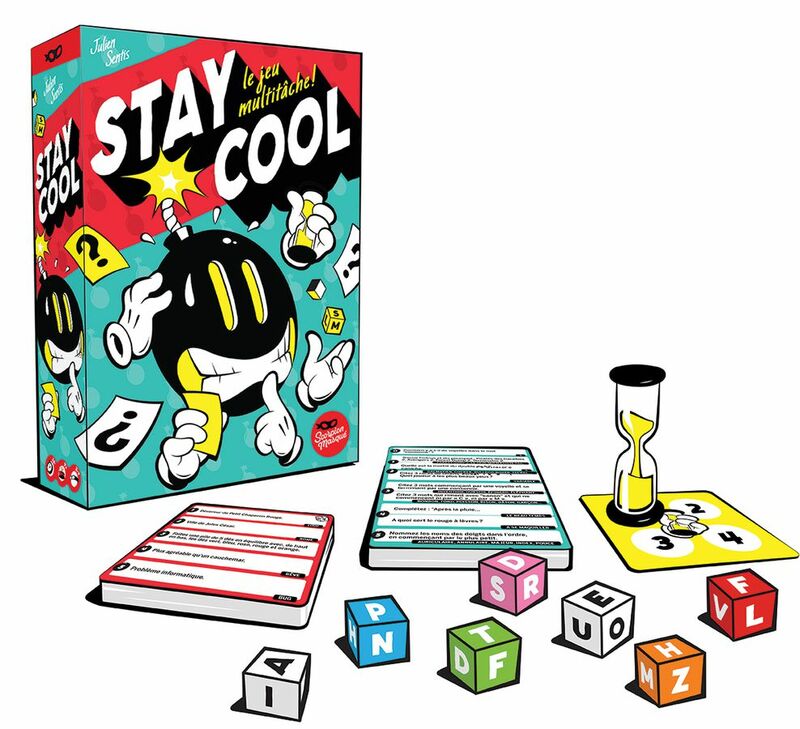 On your turn in Stay Cool you will have simultaneously answer questions from the players on your left and right, answering one of them verbally, and answering the other by spelling words with dice, essentially using them as building blocks. But wait! There’s more! On the second round of the game, you’ll have to tell a third player to flip a sandtimer before it runs out, or your turn ends early. On the third round, you do the same thing, but you can’t see the sandtimer. Speaking as someone who enjoyed last year’s Trapwords, I definitely enjoy party games with a bit of malice to them, and watching players sweat bullets trying to simultaneously answer two children’s questions sounds like superb entertainment. In all honesty, this synoposis has got me wondering if multitasking might be an under-used mechanic. Matt: Whilst this hobby keeps thrilling me with unusual game design, I absolutely adore that I get equally excited reading the synopsis of the rules of most management games. 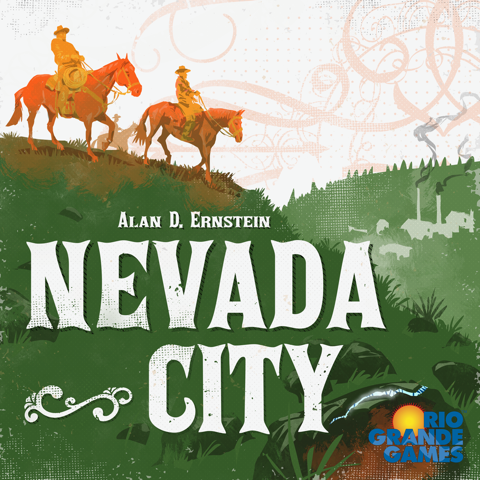 Nevada City from Rio Grande Games will break’s the publisher’s long-lived curse by having box art that is quite nice, and the big, ambitious design that’s inside it already has tiny wooden cubes fluttering around inside of my stomach. You raise homesteading families: breeding livestock, mining silver, having potentially loads of children. You’ll also be helping to build a city, hiring workers, and at the end of the year those workers will leave unless you marry them into your family by spending… booze? You might also have to hire a gunslinger to stop unhired workers from rioting. It sounds absolutely bonkers, I can’t wait to get a look at it. Quinns: The whole thing reminds me of when I saw Rob Daviau speak about his game design practice, in which he explained how he starts a project by questioning preconceptions about a genre. Using the example of worker placement games, he asked us questions like “Why do the workers work for free? Why don’t they unionise?” Nevada City looks set to explore those questions, and I’m hyped. Quinns: The first expansion for Spiel des Jahres-nominated Luxor is on Kickstarter right now! The Mummy’s Curse will add ancient mummies to this game of tomb raiding, although mostly I’m surprised that they weren’t in the game already. No mummies in your pyramid exploration game? That’s like making cookies and only adding the sugar six months later. Here at SU&SD we haven’t played Luxor yet, and while we do want to, I might advise against backing this particular Kickstarter. Queen Games’ pricing policies have often struck me as ungenerous, and this Kickstarter is a prime example. 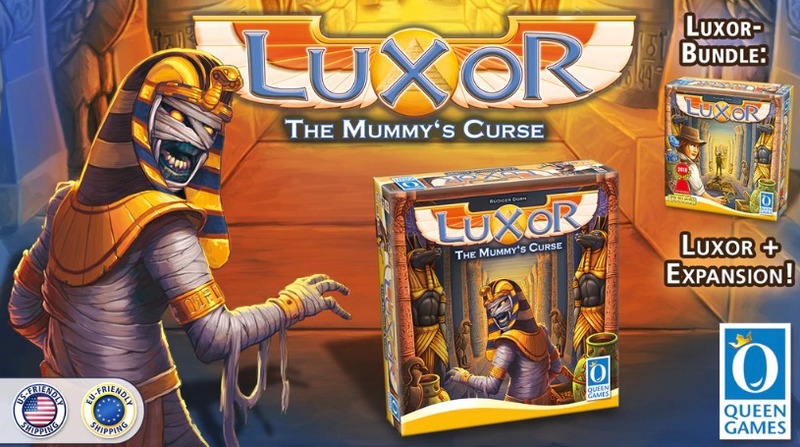 It asks for €80 + €15 shipping (a total of around $108) for the base game and the expansion, when at the time of writing the base game of Luxor in the United States costs just $35. 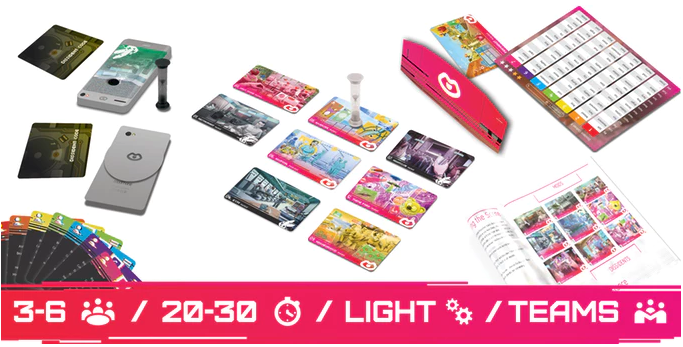 Alternatively, as with most Queen games, you could just wait a few years until they release the inevitable Luxor “Big Box” that collects the base game and all of the expansions in a single, affordable package (making FOOLS of anybody who bought the expansions as separate, costly boxes). Matt: Newspeak – the interesting design we played at UKGE in 2018 – is up on Kickstarter this week. 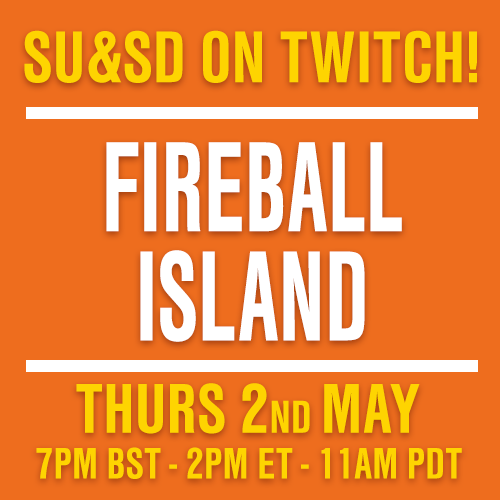 Those of you who follow the podcast will recall that I had an interesting experience playing it, although it’s tough to say how much of that came down to blood sugar levels and mild exhaustion. 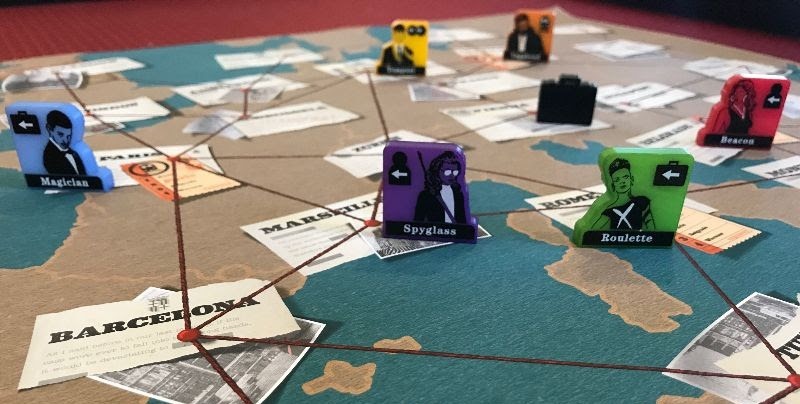 It’s a fascinating and intense little game that sits somewhere in the same vein as Decrypto – a team of dissidents must arrange to meet in one of nine locations whilst everything they say is being monitored by THE MODERATORS. Using a secret code and sheer savvy to help disguise their intentions from the gigantic watchful ears around them, the game lies in feeling out an ad-hoc system of communication that your oppressors won’t be able to untangle, but crucially your allies will. Isn’t it amazing how fun board games can also teach entirely valuable life skills! For anyone on the fence, one of the game’s designers Mark Stockton-Pitt got in touch after last week’s news to tell us that Puggsy was his favourite Megadrive game. 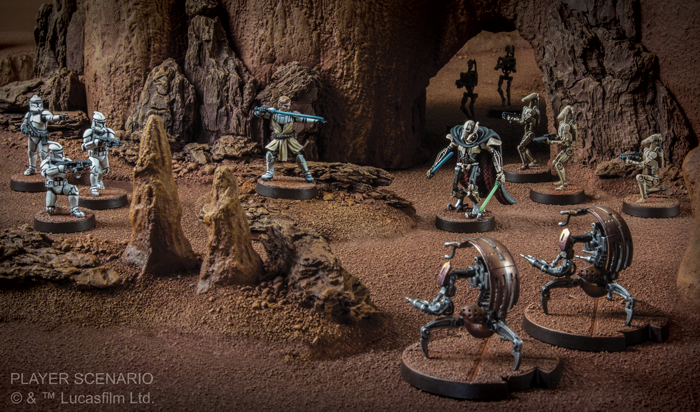 Quinns: Now this is a Kickstarter I would back. I love Decrypto, but it’s an accessible, formalised party game, whereas Newspeak is a wild, thematic labour of love. I wanted it before I saw all of the expansion modules teased in the Kickstarter. Now, I crave it.